Thoughts on people, cities and moving about. 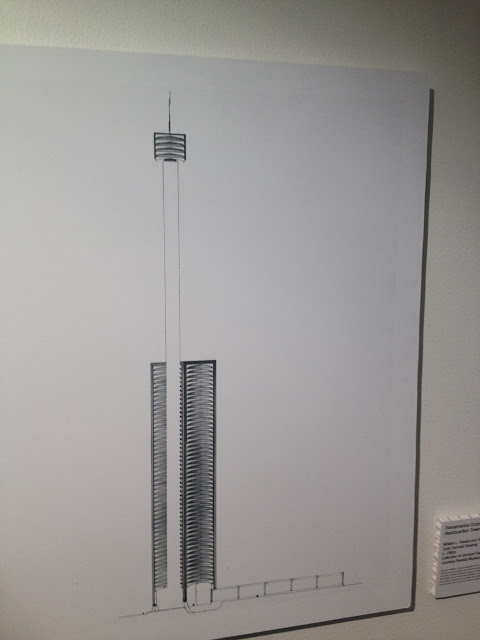 ...the architect and urbanist community will come look at your drawings and models. 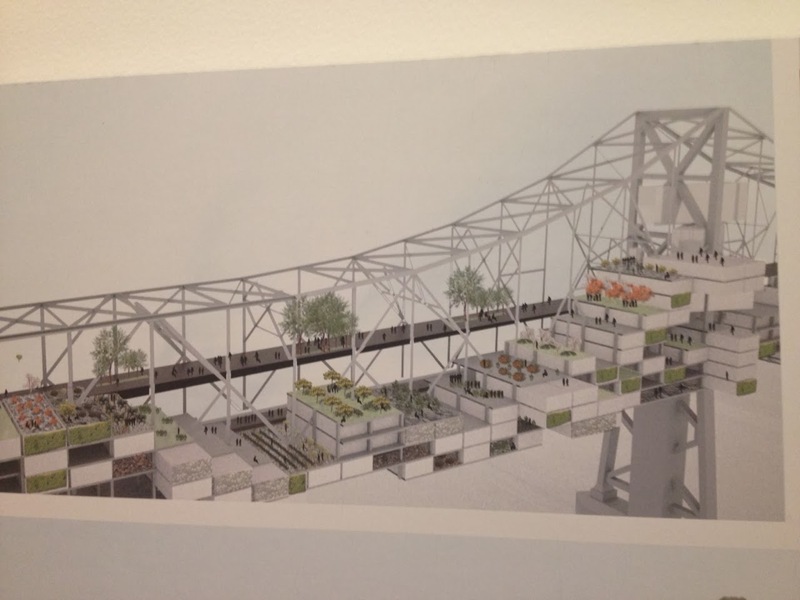 Rarely do art shows, let alone urban design shows, come together with multiple locations. 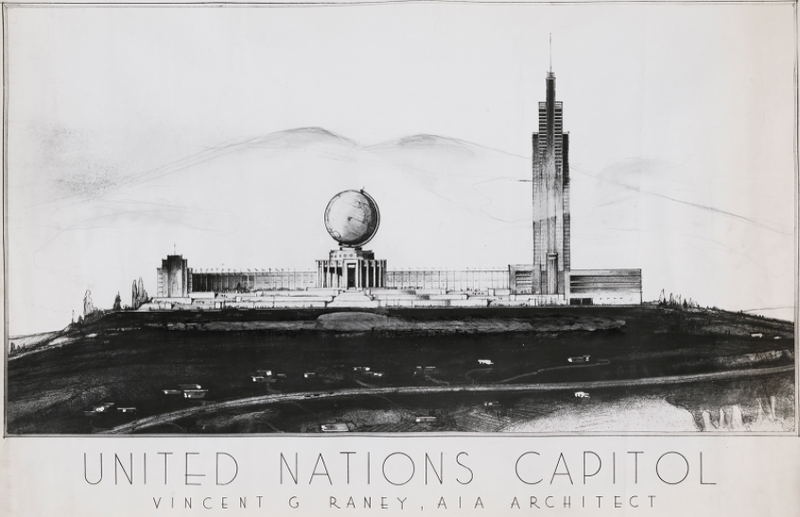 The Unbuilt San Francisco: The View from Futures Past is an ambitious show about San Francisco projects that never came to fruition. 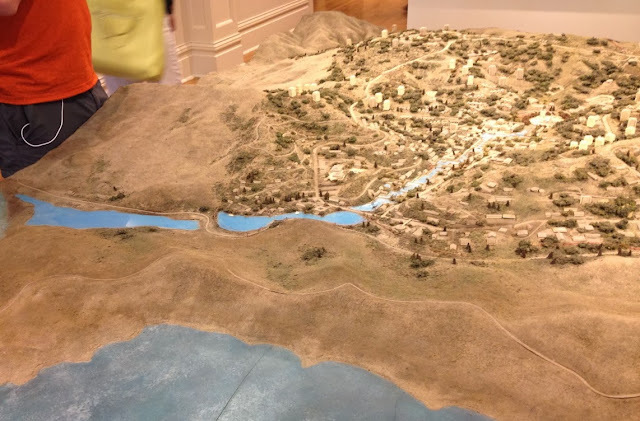 Hosted by five organizations in five locations, the show is a bold collaboration between the California Historical Society (CHS), San Francisco Planning and Urban Research Association (SPUR), San Francisco Public Library, American Institute of Architects San Francisco (AIA-SF), and the Environmental Design Archives at UC Berkeley. I attended the very busy and festive opening night on September 6, 2013 at the CHS and SPUR. Since then I have sought to visit all five sights and have already visited the show at the San Francisco Public Library and the San Francisco Architects Institutes Association. With only the UC Berkeley part to see, I'm quite impressed that the organizers have pulled all of these archival proposals that never were together in this grand show. Why did these projects not come to be, while others have been built? Is there a theme running through what doesn't get built and a different one about projects that are built? Note that the exhibit is showing for different lengths of time at each venue. 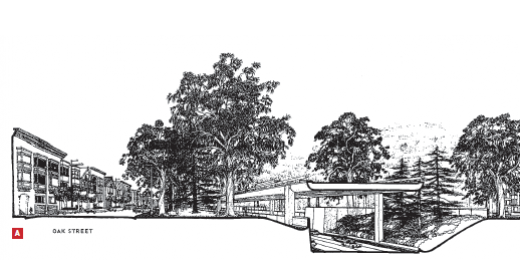 The AIA San Francisco exhibit just ended last Friday, and the UC Berkeley show ends the end of next week, so don't miss it before it's all taken down and placed back in library archives. See locations and dates at the end of the post. Below are some highlights of the show. A proposed 1960s development plan for the Marin Headlands including Rodeo Valley. The lagoon in the image below is Rodeo Lagoon. Now part of the Golden Gate National Recreation Area, this development was initially to have many mid-rise buildings, but was scaled back with a more suburban scale, and then finally dropped due to local opposition. Ever since the Bay Bridge was built, drastically reducing the need for ferries, the San Francisco Ferry Building has seen a plan for its redevelopment virtually every ten years. 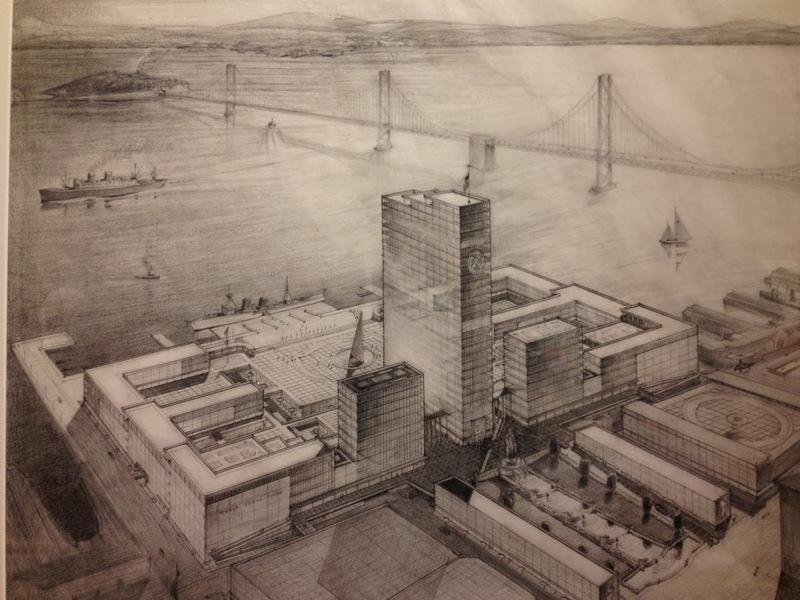 Below, the 1951 World Trade Center proposal eliminated the historic Ferry Building and replaced it with an office tower with a big clock looking down Market Street. Note the very popular grand open plazas of the 1950s and 60s. 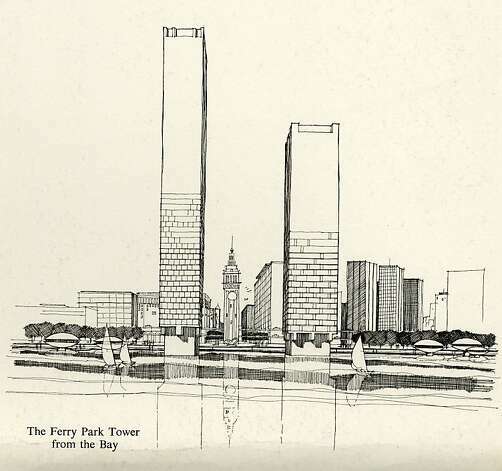 The 1961 San Francisco Downtown Plan proposed to keep the Ferry Building clock tower, shear off its wings and replace them with two tall office towers. 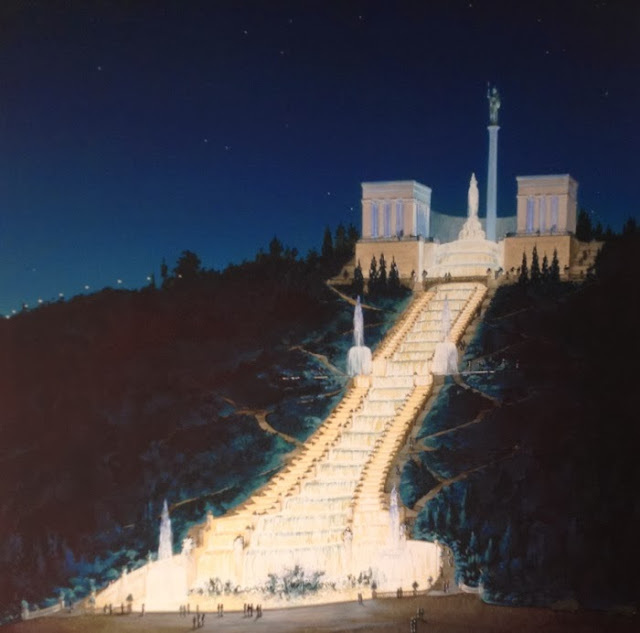 A 1933 proposal entitled, "Suggested Illuminated Water Effects of a Monument and Cascade at Twin Peaks." Designed by Bernard Maybeck who is better known for designing the Palace of Fine Arts. Two fountain/waterfall proposals. 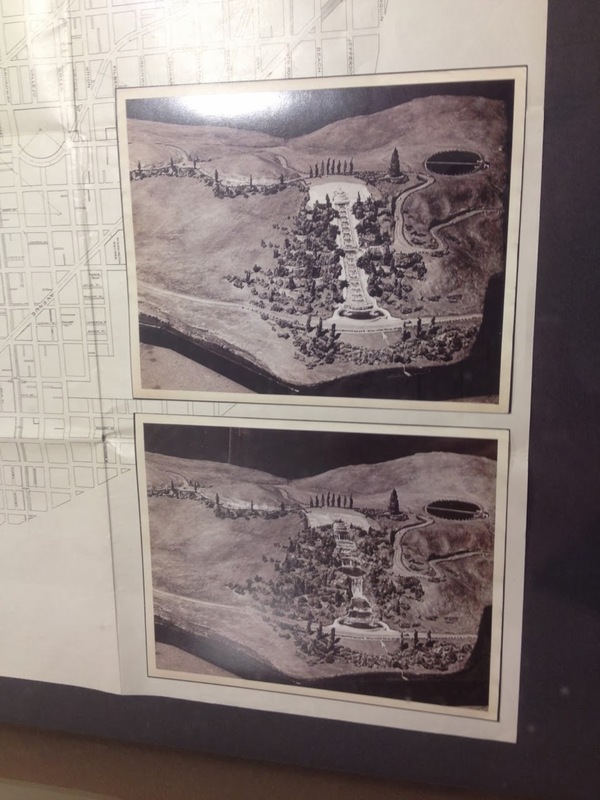 Not sure of origin, but possibly from the 1905 Daniel Burnham Plan for San Francisco. The 1905 Burnham Plan of San Francisco most famously called for building grand diagonal boulevards across san Francisco, and other streets that would take the steep slopes into considerations. As shown below, a long diagonal street crosses the Mission District (flat), and on to the Ferry Building through SoMa (flat). The plan was never realized due to cost of purchasing land and eminent domain challenges. 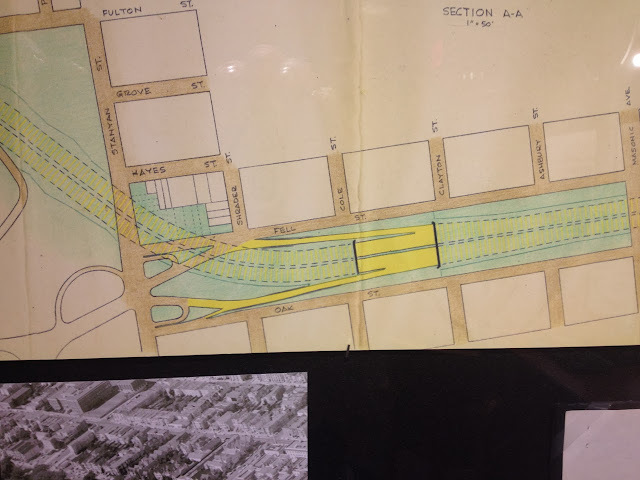 I was pleasantly surprised by some of the images of the Panhandle Freeway and the Golden Gate freeways. An original concept for the tower would have made it into a sculpture on a grand scale. Twin Peaks seems to keep figuring in on many designs. Since the UN Charter was signed in San Francisco, many called for the UN Headquarters to be built inhere. The tower to the right seems reminiscent of the Embarcadero Center and Rockefeller Center. 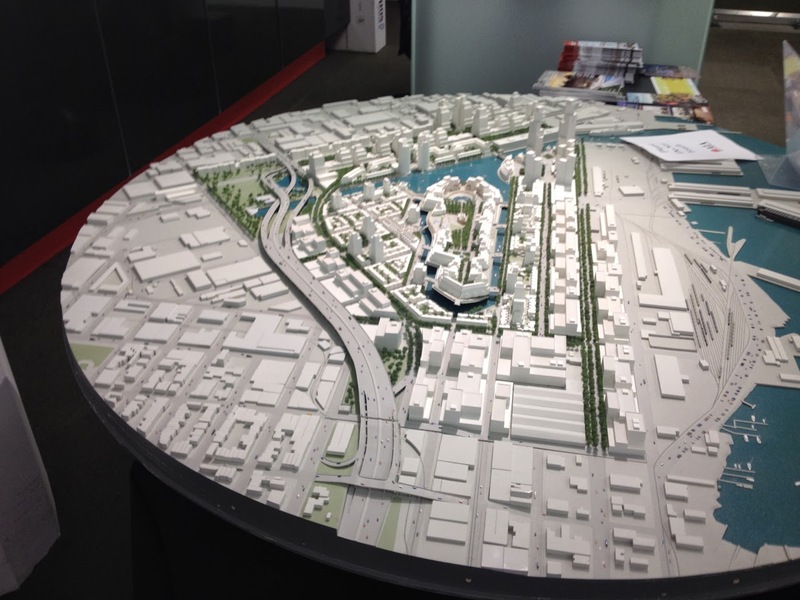 The project would have extended Mission Creek and widened it, creating an island in Mission Bay. The island appears to have draw bridges linking it to the "mainland". What you get from this show in the end is that plans are meant to propose something real, but to also sell a project and an idea. Most projects that actually move forward are toned down or reduced in scope, whether due to budget concerns, political and public backlash against a project, or changing times and demands that don't fit the original project. What I wonder is, what makes certain projects move forward and come to fruition (with some adjustments), while others never break ground. 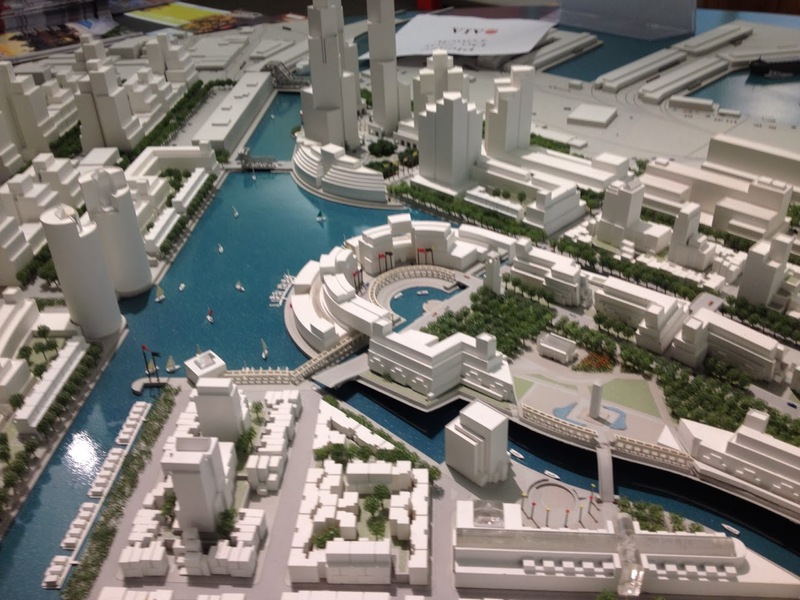 Some of these unbuilt projects seem fanciful or even ludicrous, while others appear to have been a great idea. That said, the Transamerica Pyramid and replacing a freeway with a boulevard must have seemed ludicrous ideas when originally presented.